EMCORE’s closed-loop Fiber Optic Gyroscope (FOG) technology is designed for fast, accurate navigation and gyrocompassing, and low noise line-of-sight stabilization. Our long-standing leadership in the development of highly-accurate defense and military grade fiber optic components and systems has paved the way for the development of more accurate and economical FOG components. 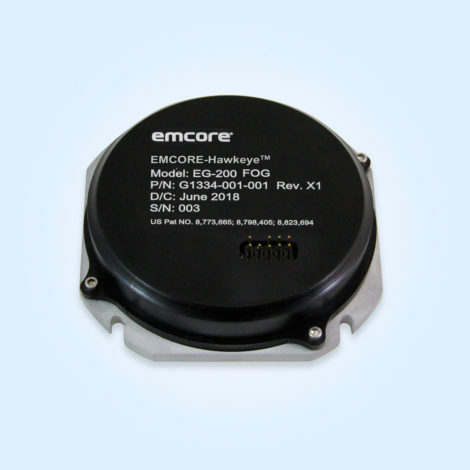 EMCORE’s EG-200 Fiber Optic Gyro features EMCORE-HawkeyeTM fully-integrated optics and electronics, and is a superior device in regards to weight and form-factor for tactical applications. It incorporates advanced, next-generation Field Programmable Gate Array (FPGA) electronics that deliver higher accuracy, lower noise, greater efficiency and reliability, combined with low cost. The integrated FPGA electronics also improve optical drift stability, environmental flexibility and linearity compared to competing technologies. The EG-200 can be calibrated internally for better thermal effect and has both digital and analog outputs to accommodate the widest variety of installation parameters.